And I’m back! I realized tonight as I was writing this post that it’s been a week since I last posted. Where does the time go?? Life seems to get in the way and unfortunately the blog is the first thing that gets neglected (well really it’s the gym). On a happy note–it’s my birthday week! Oh yeah! I’ll be accepting gifts all month in the form of gift cards, cash, miniature ponies, your filled piggy banks, your laundry lint, or whatever junk you want to get rid of so just send them on over 🙂 I joke I joke, I kid, I kid….well, not really. This year I’ve treated myself to a mini vaca to the Big Apple–New York City, baby! I leave next week and I couldn’t be more excited. Since I’ve been to NY before and done all that touristy stuff, this trip will focus more on foodie stuff. Five glorious days in of the greatest culinary cities! I plan to eat my way through NYC, one borough at a time. Oh dear! I feel like I’m dreaming….I’ve already been planning which restaurants I must visit. If anyone has any suggestions please, please, please tell me! This Florida girl needs all the help I can get! In the meantime, I’ll be posting a few more recipes before my departure. Tonight’s dish is so easy to make ( I feel like I say that every time, but it’s true!!) 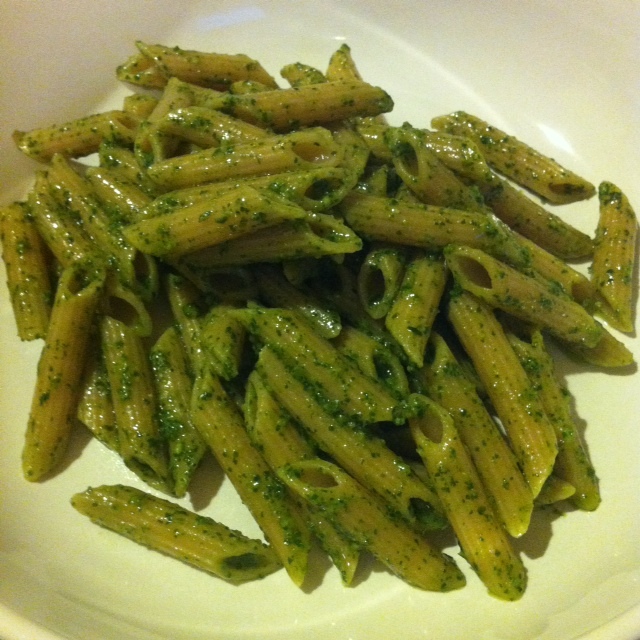 Typically pesto is served with pasta but it’s so versatile and tasty that you can use it for many different dishes. I like to use it for bruschetta or spooned on top of chicken breasts or fish, as well. This pesto comes from the region of Liguria from Genova, hence the name. Tonight I made it with whole wheat penne (errrr, not really my fave, but it’s healthier for you) and it came out great! I realize that lately I’ve been posting a lot of pasta dishes. For those of you on the low-carb thing I apologize but pasta for me is tops! I have always eaten pasta 2-3 times per week and I don’t think I’ll ever stop. A lot of people in this country are so afraid of carbs and have this aversion to them like they’re the devil. Moderation, people!! Portion size!! Exercise!! It’s interesting to note that in Italy pasta is eaten quite frequently and obesity is nowhere near as prevalent as it is here. I think part of this has to do with the ingredients–most Italians use fresh, local, and organic ingredients. They tend to eat a lot of vegetables and keeps their portions small. Obviously some people are genetically pre-disposed to weight gain and there are a myriad of health factors that contribute to the obesity epidemic but I believe that you can pretty much eat whatever you want as long as it’s in moderation and you exercise. So that’s my rant. Maybe you agree, maybe you don’t but I still hope that you try the recipe and enjoy it with some pasta! Come on, indulge a bit! A quick note–I really don’t measure anything when I make this so the measurements are just approximations. Sorry 😦 Just keep tasting it and adding whatever ingredient you think is lacking. In a food processor, stick all the basil in. Toss in the pine nuts, cheese, and garlic. Pulse a few times to break down the garlic. Open the top and with a spatula scrape down the sides of the container. Season with some salt and pepper. Now, put the food processor on puree and while it’s going pour in the olive oil. Not too much! Remember you can always add more if it’s too thick. If you have leftover sauce, put it in a jar and make sure that you pour some olive oil on top to create a seal. If you don’t, the basil will get exposed to oxygen and turn black! Just a small layer on top will do the trick. You can also freeze it! A neat idea is to pour it in ice-cube trays, freeze it, pop them out and store them in a Ziploc bag. You can use it to flavor soups, pasta sauces, etc. It’s easy and convenient. Is it that weird that we made pesto the same night? Nice one. gelosa!. Do some shopping and take pictures. Nice recipe. 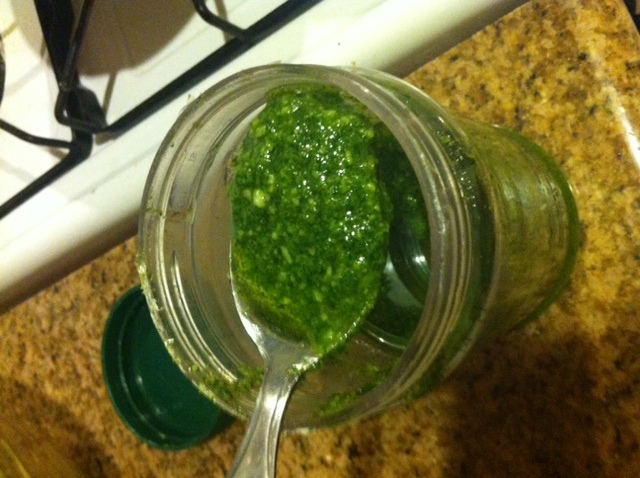 I have been experimenting with pesto and have found that a little mint really compliments the basil and gives the finished pesto a bright, fresh minty taste (not too much, though). Keep up the great recipes, Mel.